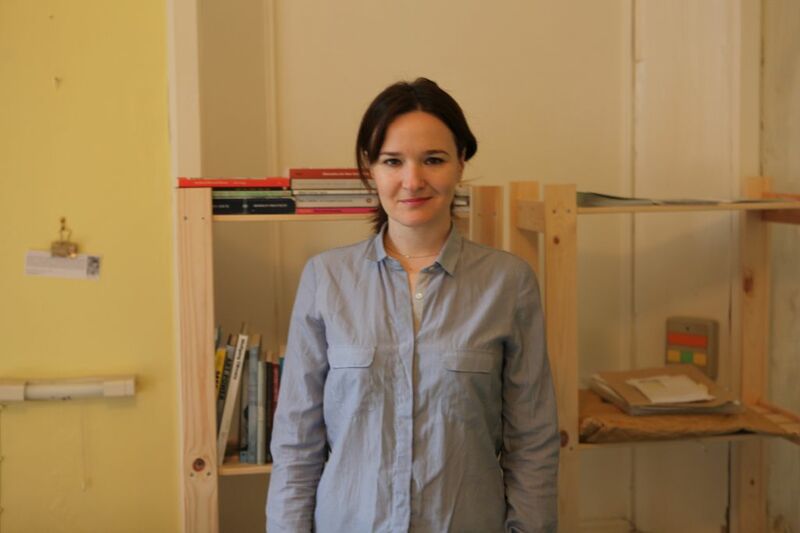 Jennie Guy is an artist, writer and curator based in Dublin. I met her in her studio in Broadstone Studios to talk to her about her practice. Jennie in her studio at Broadstone Studios in Dublin, 2013. Image courtesy of the artist. Livestock Reading, 2010. 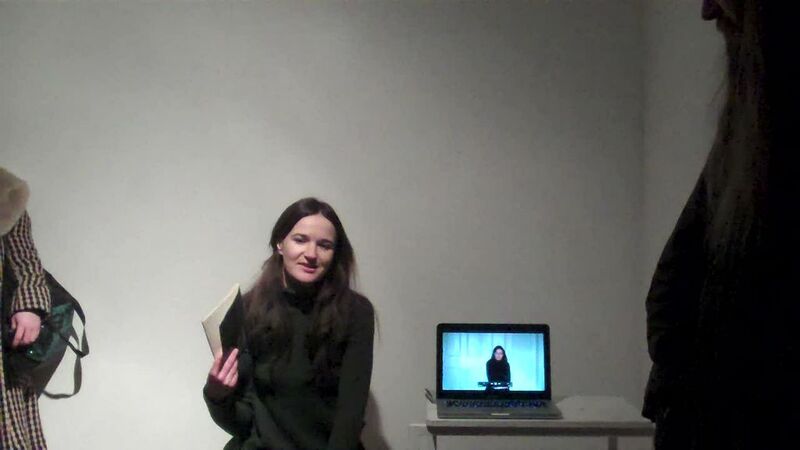 Jennie performing in the Market Studios alongside a recorded video diary of her reading aloud. Image courtesy of the artist. Jennie’s work frequently involves audience participation and she is interested in the possibility of something happening or not happening as a result of this. She is also drawn to the notion of “what would happen if nothing happened?” She does not regard the audience as a tool in her participatory works, rather she sees the work as an inclusive moment that people can choose to be a part of or not. Each work is temporal and unique because of this invited participation and because of the possibility that the audience may reject this gesture. Her project Reading Ensemble involves this type of audience participation. To date, the project has evolved through three performances. The first was held in the Market Studios in 2010. 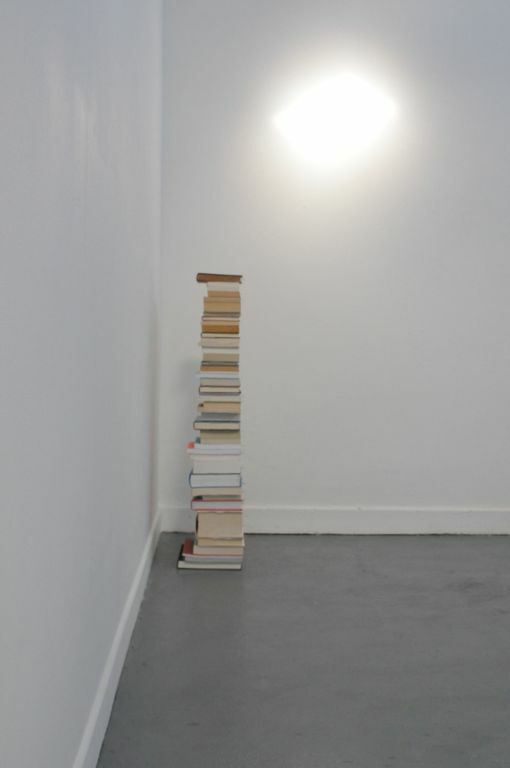 Jennie presented a sculpture in the corner of the gallery that was made from a selection of books from her library. She handed the books out to the audience members and they read aloud certain highlighted passages. They were instructed to read until the books were taken from them and returned to recreate the book-pile-sculpture. The voices created what Jennie referred to as a “sculptural volume” within the gallery space; it slowly built towards a climax before eventually dissipating. Reading Ensemble I, 2010. Book-pile-sculpture. Image courtesy of the artist. The next stage in this project, Reading Ensemble II, was a collaboration with the London-based writer David Berridge. 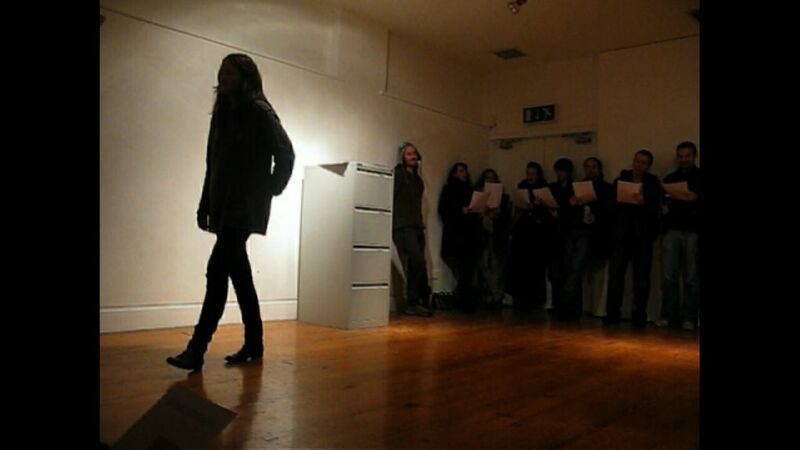 The work was presented in the Galway Arts Centre in 2011 as part of an evening curated by Russell Hart called Das Splinter. Jennie invited David to select texts that she would then put into a filing cabinet that would stand in the gallery. The texts were again handed out to the audience to be read aloud according to a loose score that focused on alternating moments of fragility and density. Reading Ensemble II, 2011. Video still. Courtesy of Russell Hart. 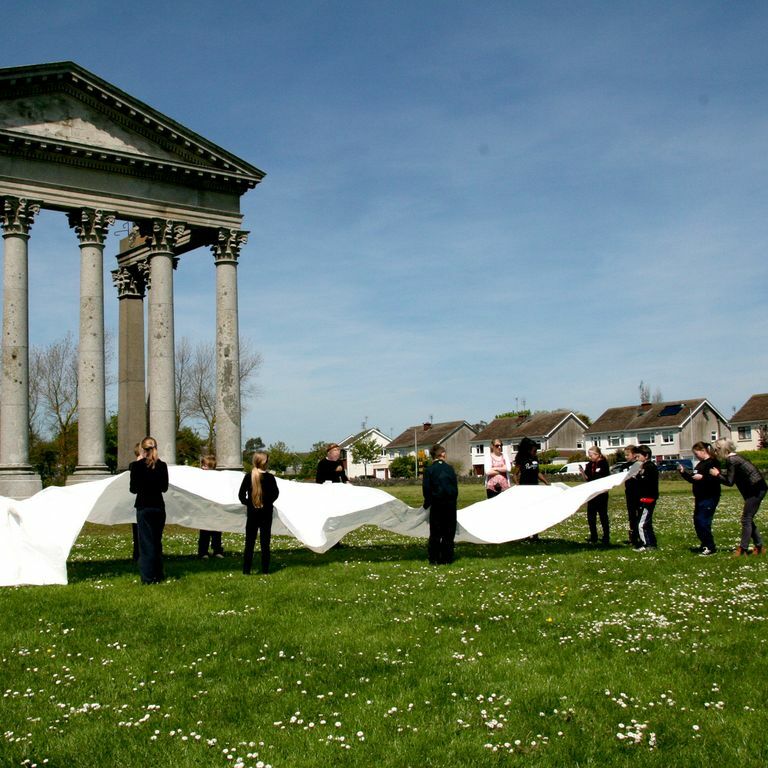 The most recent phase of this project, Reading Ensemble III, was commissioned by the National Irish Visual Artists’ Library (NIVAL) and developed for the Document! exhibition in the NCAD gallery. Jennie invited the librarians to select texts from the collection of books and ephemera housed in the library so that she could edit and then distribute these to students of NCAD to read aloud together, “emphasising a confrontation between emerging talent and institutional memory”. She said that this was a great opportunity to read the library in a different kind of way as well as being able to activate the space. Excerpt from Reading Ensemble III, 2012. Video courtesy of the artist. Video recording of Melancholy Park, 2010. Video courtesy of the artist. Writing is a fundamental part of Jennie’s art practice. She recently wrote a piece of philosophical fiction for the News Views publication the Firestation Artists’ Studios published in 2012. The overall subject of the publication was archives, so Jennie was able to continue her research into this subject and then pull in different strands of that research to compose a parallel piece of writing. The piece she wrote, entitled Opening a Fissure/Filling a Void or What We Talk About When We Talk About Archives is really about exploring the idea of what an archive is and how it might refuse to function. Excerpt from Opening a Fissure/Filling a Void or What We Talk About When We Talk About Archives, 2012. The text is a second-person narrative that sets out six questions relating to peoples feelings or thoughts about archives that can be answered by choosing from one of five answers. After the writer has set out these questions she realises that she will then have to figure out what all the answers mean – and this is a daunting task. The fictional narrative, which focuses on a couple “whose character traits establish a metaphor for wrestling with an archive”, continues after this realisation, and the story ends with the beginning of an archive dilemma… “Their knuckles are both clenched as the drawer finally bursts open, revealing a startling series of vibrant objects”. At the moment Jennie is concentrating on further developing her writing practice. She said that although writing does not necessarily come easily to her, it is something she is drawn to do. She explained that her writing could easily shift to become a performative reading work but she is interested in writing something herself rather that using appropriated texts as she has done in the recent past. Another prominent theme in Jennie’s practice is the idea of hospitality. One particular project she undertook in 2010 with artist Claire Behan entitled Souvenir invited women who were seeking political asylum in Ireland to gather for a Hospitality Day and cook their favourite recipes, many of which were derived from their countries of origin. It had become clear during a series of workshops hosted with this group of women that because of the restrictive accommodation asylum seekers live in they do not have the opportunity to cook for themselves. This day was hosted in order to highlight the significance of cooking for yourself and the independence it can give. Jennie and Claire made a limited print run of these recipes, each introduced by the women who made them, on t-shirts and tea towels that they distributed at the Tate Modern in London at the festival ‘No Soul for Sale’ to celebrate the 10th anniversary of the Turbine Hall. The format of the souvenirs mimicked the graphical content usually found on cheesy Irish tourist paraphernalia, highlighting a sense of cultural displacement and estrangement. 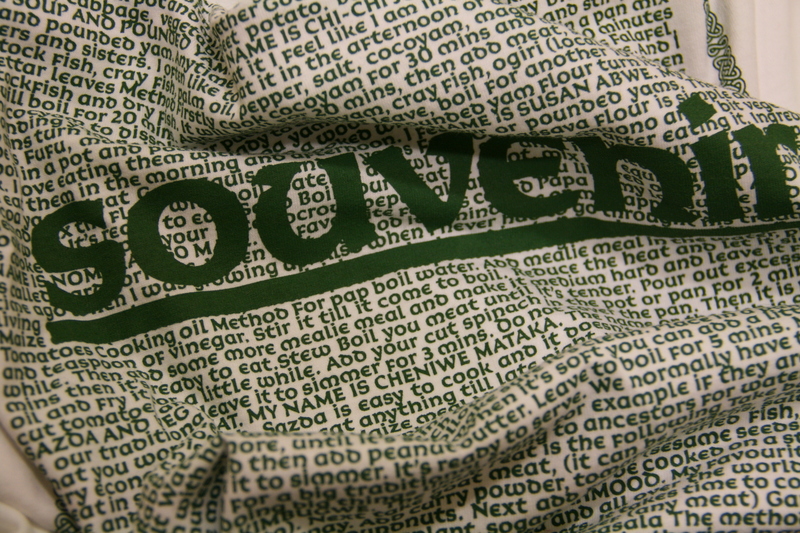 One of the limited edition t-shirt prints for Souvenir, 2010. This thread of hospitality is something that also runs through Jennie’s curatorial practice. She worked with curator Vaari Claffey as assistant curator for Gracelands in 2009 and 2011. One of the reasons that she was drawn to work on both of these projects was the fact that the exhibitions transpired as a series of events. Gracelands is a combination of screenings, commissioned works, performances, sculpture and readings. A lot happens over a short space of time and Jennie likes the fact that it is momentary, even intangible, but very dynamic and inclusive. In 2012, Jennie and fellow curator Cleo Fagan created and curated the Mobile Art School – a project that extends one of her core concerns with bringing new audiences into contact with diverse contemporary art practices. They initiated a pilot programme last May that brought contemporary artists into the 5th class of St. Catherine’s Primary School in Dublin introducing the children to different media that can be used in contemporary art. The idea behind the project is to try to complement the education curriculum by introducing an understanding of contemporary art at an early age. Nine well-known artists worked with the students in two-hour blocks for a period of three months. Jennie and Cleo’s vision with this project is that it will eventually work sustainably with schools that it is introduced to. They would like the project to be able to support an artist-in-residence in a number of schools so that the artist and the school could take ownership of the project and continue to expand learning independently. Mobile Art School, 2012. Artist Ruth Lyons working on a moving image workshop. Image courtesy of the artist.